Expand your living space into the outdoors! Hardscaping your backyard can create an outdoor living room with a fire place, an outdoor kitchen, or extend the use of your patio with a fire pit. In addition to the concrete supplies needed for your hardscaping, we carry supplies for creating fire places, fire pits, and outdoor kitchens. Fire pits make for enjoyable and relaxing evenings in your own back yard and extend the amount of time you can comfortably site outside. Nothing makes a cool evening more enjoyable than sitting by a roaring outdoor fire and engaged in interesting conversation. A professional mason can make a fire pit out of concrete or even stamped concrete, and it will look just wonderful. But you will still need the burner kit and other accessories like decorative glass and lava rock. Sealant Depot makes that a simple task for you. We carry everything that you’ll need. 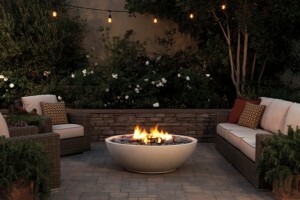 Stunning pre-made concrete fire-bowls with burners, rock, and optional covers are also available. Not all options are available online, so please contact us if you don't see something listed. An outdoor kitchen can become an extension of your home all spring, summer, and fall. For some people, the building blocks for an outdoor kitchen and fireplace can speed up the process of building a spectacular outdoor living space. We sell Eldorado Outdoor Cabinets. Ask us if this might be the solution you’re looking for. 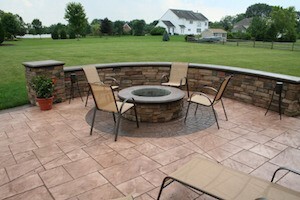 Concrete product specialists can help you identify the fire pit design appropriate for your backyard hardscape project. And they can guide you through the supplies for fire pits, outdoor fireplaces, and outdoor kitchen kits as well. If you don't see what you need in the online store, there are literally hundreds of items in dozens of configurations and shapes available to you through Sealant Depot, Inc. We are still building our web offering. Please contact us about your design and we can help you build it. 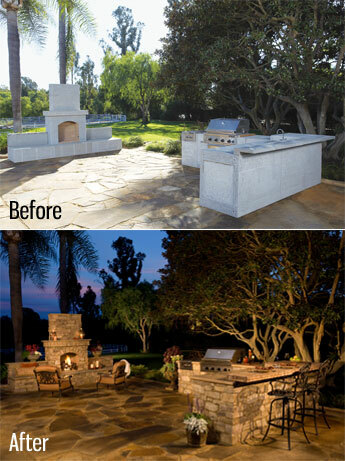 Contact Sealant Depot for more information supplies to create a gas fire pit and cabinets for an outdoor kitchen or fireplace.